Cafe Nevo is a Tel Aviv gathering place for artists, politicians, lovers - Jews and Arabs, the old and the young, conservatives and radicals. It is presided over by Emmanuel Sternholz, the proprietor-waiter whose unblinking gaze takes in the tangled web of destinies and desires spun out around him. In this comic, tragic, and compelling mosaic of intertwined lives, Barbara Rogan has created a dazzling work of fiction - and a marvelously illuminating mirror of Israel today. 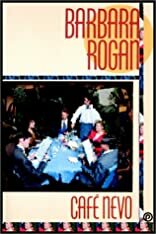 About Barbara Rogan (Author) : Barbara Rogan is a published author. Some of the published credits of Barbara Rogan include Saving Grace, Cafe Nevo, Rowing In Eden.